This year, I bought 2 planners- from Daiso and Uni Paper (sold by Popular). In this article, I would like to do a comparison between both the planners. But first, why would we want a monthly spread planner? Why not an organizer, a notebook or a diary? I can only speak from my personal experience. First, a monthly spread planner is quite thin and easily fits into a handbag or carry on case without adding much weight. It helps me to check on important dates and appointments at a glance. I have this in my Kaison calendar but the calendar is kept at home. I prefer to keep it separate from my daily dairy as I do not want to carry my diary when I go out- it makes my bag heavier and I do not want to lose my diary. Price: The Uni Paper planner cost RM5 from Popular book store. The Daiso planner costs RM5.90. The Uni paper colour (smaller size, A5 I think) comes in a few designs but the cover this year is white colour (easier to get dirty). It is slightly bigger than the Daiso planner. 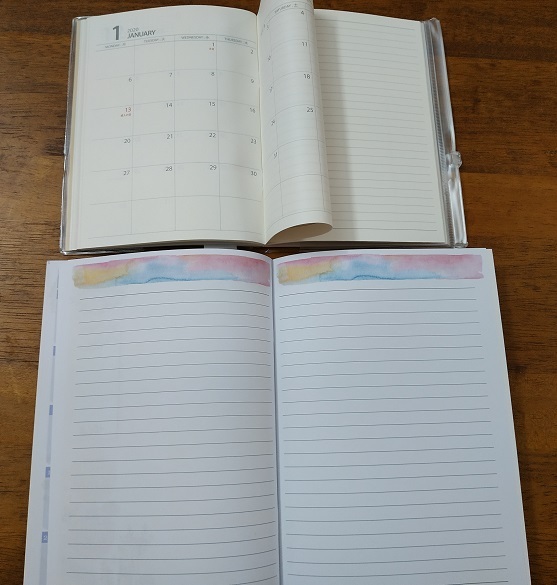 The Daiso planner’s comes in a few different colours. The cover is quite thin but it is made durable by the protective plastic covering. Both provides the 2019 and 2020 calendars. 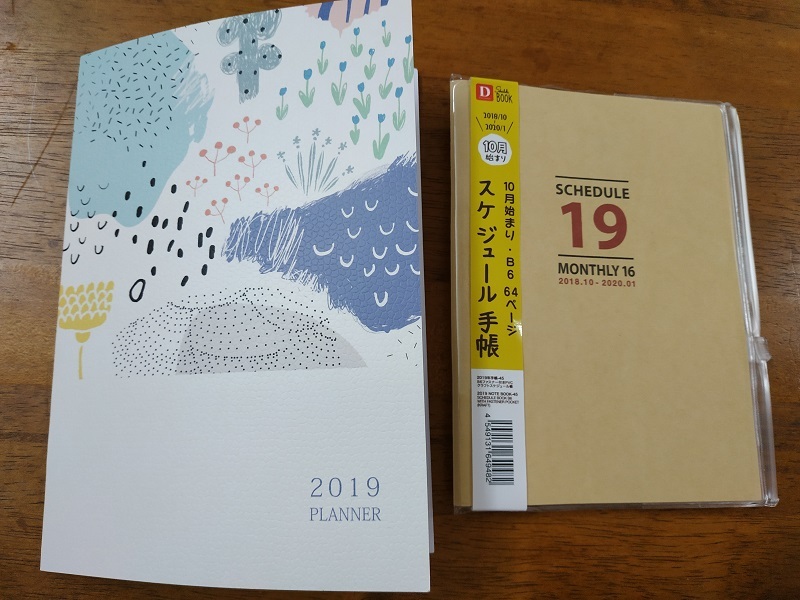 The Daiso planner also have the 2021 calendar. The Uni Paper planner is thicker and comes in better quality. 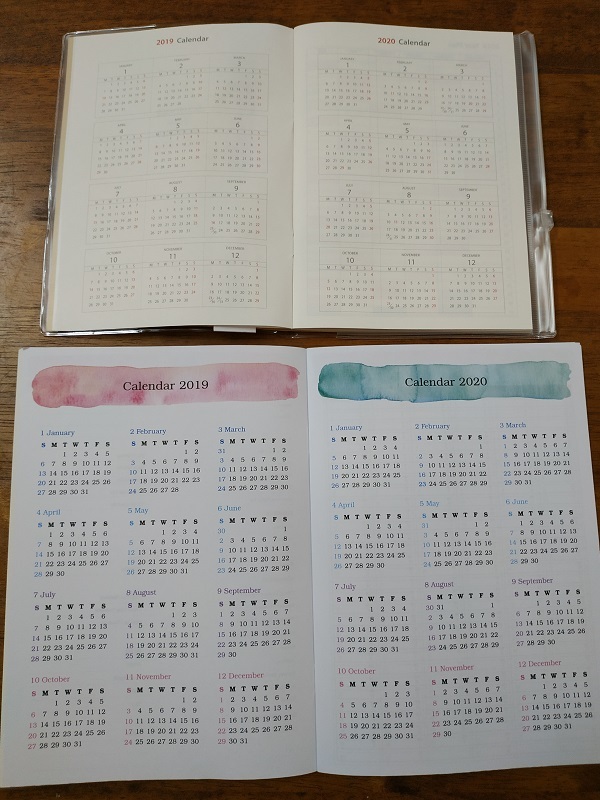 The year at a glance of both planners: The Daiso planner is more plain in design whereas the Uni Paper is more colourful. Some people prefer plain while some prefer creative designs. Monthly spreads: What initially attracted me to the Uni Paper planner is the colourful pastel and creative designs. Each month comes in a different pastel tone with nice flower-animal theme. You would feel inspired to write on it- and if you are afraid of making mistakes, then you can do like I do -write using Pilot Frixion pens which you can erase. 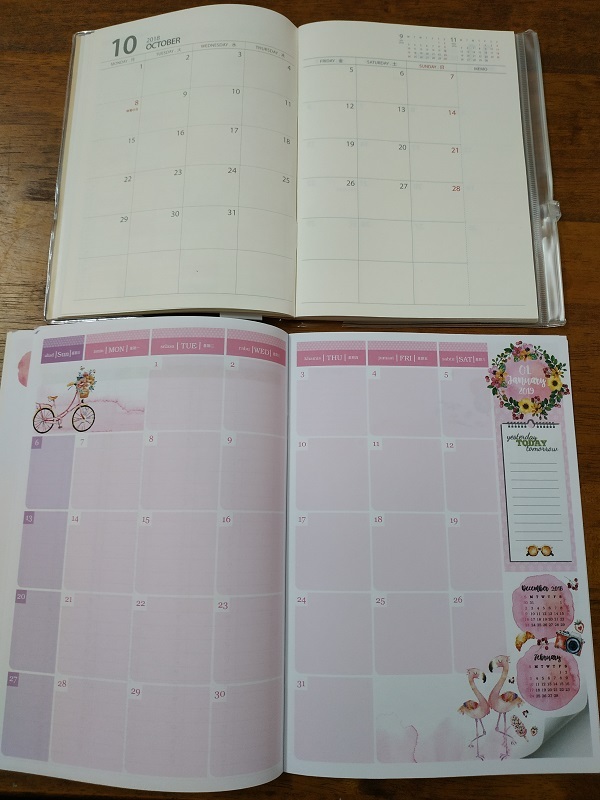 The Daiso monthly planner has more plain design. It is suited to those who do not like the colourful designs or pastels. When you write, the ink will bleed through to the other page easily so avoid using thick ball point or fountain pens. One thing I like about the Daiso planner is the first month starts on October 2018 all the way till January 2020. So happen so that I needed to start plotting into the monthly planner starting from November 2018 and this planner enables me to start within this month. This is one of the main factors that made me buy this planner. After the monthly spread, both planners have some lined pages to jot down additional notes. There are some other planners that restrict the info such as address and contact number. I like it that both planners keep the pages plain to enable each person to put in what they need. The difference is the design- one is plain while the other is colourful. Lastly, the personal data page is located at the front for the Uni Paper. Whereas for the Daiso planner, it is located at the back. RELATED: What type of diaries/ planners/ calendars to increase planning and productivity? Uni Paper planner: For me to schedule and plan activities/updates related to my blogs. A lot of creative process goes into my blogs hence this blog would be suited for the purpose. Generally I prefer to keep my blog updates and activities separate. 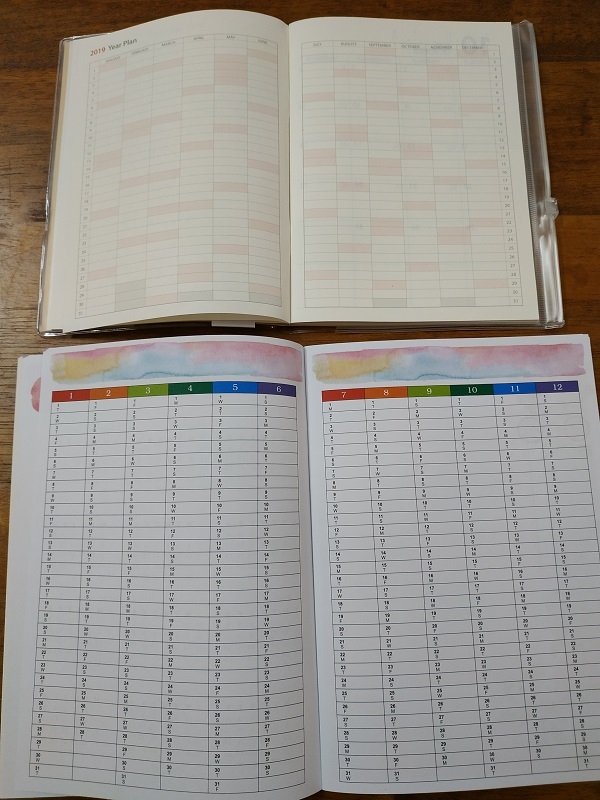 Daiso planner: I would schedule appointments, important dates/reminders and birthdays for me to be able to view at a glance. It is also for me to plan certain events by breaking down tasks into smaller and more manageable chunks. If you find yourself forgetting important appointments and dates, you may want to consider getting yourself a planner. Yes, some may prefer to input in their electronic calendars and sync it across their devices. Personally I prefer a physical planner where I can customize and see everything at a glance. Regardless of whatever system that you are using, most important it is something that you are comfortable and would stick to it. Sometimes it takes trial and error to figure out a method that works. Both the planners above cost less than RM6 each, which is lesser than what you usually pay for a meal outside. I figured there is nothing much to lose and could potentially help in getting us more organized and less overwhelmed.